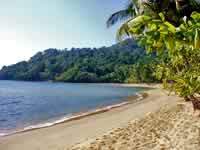 Virtual Travel & Island Guide about Wai Chek Beach on Ko Chang in Thailand. Wai Chek Beach ("Haad Wai Chek"), also Wai Check Beach or Wai Chaek Beach, is a 300 metre long beautiful sand beach, which is considered to be one of the most beautiful beaches on Ko Chang. 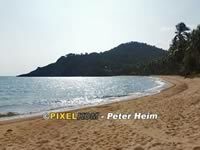 It is located approximately 5 to 6 kilometres southeast from Baan Bang Bao (the fisherman village in Bang Bao Bay) and around 1 kilometre west before the inlet to the Salak Phet Bay (Aow Salak Phet), almost exactly in the centre of the south of Ko Chang. 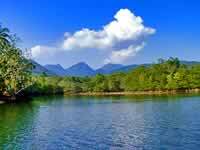 On the southern side it is limited by a small river, whose banks are closely covered by mangroves. The river estuary is broad and suitable for swimming, as well as the sea in front of the sandy beach. In the flat land behind the beach is a coconut plantation that is farmed by a Thai family living there. End of 2009 there was (still) no accommodation at "Haad Wai Check", so this beach is the only one on the entire island that doesn't locate neither a hotel nor a bungalow resort! 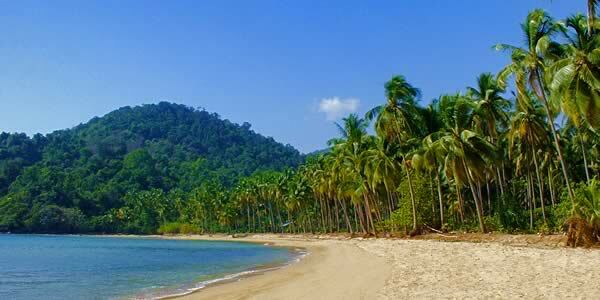 Wai Chek Beach can be reached by chartered boat, motorbike or car including a short walk. At the south western end of Salak Phet Bay there is an artificial lake with a restaurant built on stakes (on the left hand side). Opposite is a small "checkpoint" with an open gate: drive into the small asphalt road to the right. After a few kilometres you'll reach a bridge that fell down. If you'll walk further on after a few hundred metres you have to take a dirt track to the left to reach Wai Chek Beach. As there are no signs it's quite difficult to find this wonderful beach! All 360° Virtual Reality Panoramas and panorama pictures from April 2005, photographs from April 2002.